Chuck's Chatter: Can we do away with tornado F/EF-scale ratings? Can we do away with tornado F/EF-scale ratings? Let me state at the outset that I have no doubt meteorology will be saddled with the curse of F/EF-scale ratings for a long time to come, so this is mostly an exercise in futility. Why do I dislike these ratings? The main problems I have with them are discussed here. The essence of why they bother me and seem so counter-productive is that they represent an effort to provide a simple summary measure of something that's very complex. I suppose having a rating is better than not having any information about the intensity (i.e., windspeeds) in a tornado and thereby assuming they're all the same. But that's not the only choice we professionals have. Consider just one damage indicator, say a particular type of framing attachment in a typical American frame home. A host of complex issues are associated with the failure of that particular type of attachment, such that if you could test a large number of such attachments by subjecting them all to the winds in a wind tunnel wherein you knew the windspeeds accurately, you would find that there's no single value of the windspeed that would cause that type of attachment to fail. Instead, because each such attachment is a unique combination of components, the failure of that type of attachment would be associated with a range of windspeeds. In doing a survey of tornado damage, you would not be able to know precisely what windspeed caused the failure of that attachment - rather, failures would occur within a range of windspeeds. This is true regardless of what damage indicator you use. At best, a given amount of damage can never be said to have a single, precise value of windspeed that would cause that amount of damage. Thus, in the absence of any way to measure the windspeeds that produced that damage, the best one can do is know the distribution of windspeeds that cause that amount of damage. You might choose the media (or the mean) within the distribution to represent some sort of a guess, but doing so is intrinsically wrong from a scientific viewpoint. Further, we know very little about the actual spatial and temporal distribution of windspeeds in a tornado, even for those few tornadoes sampled with mobile Doppler radars. It's common to idealize the airflow in tornadoes using some simple model, such as that of a so-called Rankine Combined Vortex. All one needs to do to convince oneself that most real tornadoes probably don't fit that model very well in detail is look at some tornado videos. The actual winds in a tornado, especially those with multiple vortices, can be vastly more complex than any simplified vortex model. It's these real winds that interact with real objects in the path of the tornado to produce the observed damage. This is a very important fact that makes it currently impossible to know by objective measurement what windspeeds are associated with any particular element of damage. The time sequence of winds experienced by some damage indicator simply isn't known. Plus the presence of debris in the wind - which alters the wind distribution - adds an additional level of complication. Thus, a complex, debris-laden windfield interacting with objects whose failure points cannot be known precisely makes this whole issue vastly more complicated than what can be expressed by some single summary number. Reality is staggeringly complex and the idea that one number can offer much insight is too absurd to consider. Except that's precisely what the existing F/EF-scale ratings are trying to accomplish. There's no hope that in what remains of my life and for the foreseeable future, it will ever be possible to have wholly objective, high-resolution measures of tornado windspeeds. Yet, we continue to use these rating systems with hard boundaries between categories, and category boundary values that are essentially arbitrary and without any real significance. Is it really plausible to say that an estimated windspeed of 199 mph (EF-4) is actually distinguishable from one of 200 mph (EF-5)? Can we really make such a distinction based on various observed levels of damage to damage indicators? Does it make sense to call a tornado an EF-5 based on a single damage indicator at one point in an extensive damage path? 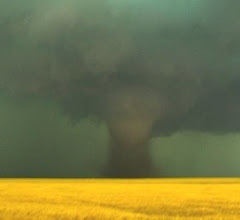 The science of tornadoes is riddled with uncertainties, so there can be no plausible reason to accept as meaningful some single summary measure based on making numerous simplifying assumptions and creating arbitrary categories. Science has learned how to make those uncertainties work for us in coming to conclusions, via the methods of statistics. If we're going to have a scientific data base that's of much help to the science, it shouldn't be using the F/EF-scale rating of tornado windspeeds as some sort of meaningful measure. Distributions of estimated windspeed, probabilities of windspeed values associated with particular damage observations - these are much more appropriate tools with which the science can work. Every professional knows already that such ratings have many problems and are a very crude way to think about the phenomena. I get that the public may not care about the subtleties here. There may well be pressure to produce some sort of summary measure for the masses of non-scientists. Fine. Let someone decide how to do that, hopefully based on some reasonable application of science and engineering. But professionals surely can do better than condensing all the complexity and accompanying uncertainty into one summary number. I say we should do away with the ratings, at least at the science level.